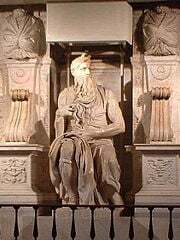 Moses or Móshe (Hebrew: מֹשֶׁה) was the Hebrew liberator, prophet and lawgiver, who according to the Bible and the Qur'an (by his Arabic name Musa), freed the Hebrew slaves from Egypt, and at Mount Sinai, provided the them with the Mosaic Law, or Torah, including the Ten Commandments. The Bible portrays Moses as the first person to learn the true name of God, and he is honored in Jewish tradition as a person of unequaled spiritual character. All three Abrahamic faiths—Judaism, Christianity and Islam—revere Moses as a great prophet. Moses was one of greatest miracle-workers of all time, and his dramatic exploits are better known than any other pre-Christian biblical figure. Traditionally, he is credited with writing the first five books of the Hebrew Bible, which are also known as the Pentateuch, the Torah or the Books of Moses. Yet outside of the Bible, Moses is unknown to history, and modern scholars have questioned the Bible's account of his exploits and even his existence as a historical figure. The Hebrew Bible is the primary source for a biography of Moses, although scholars have sought to explain away the most legendary aspects and have added some additional features from archaeological data, textual criticism and observations of ancient cultures. The birth of Moses occurred at a time when the current Egyptian monarch had commanded that all male Hebrew children should be killed by drowning in the Nile River (Exod. 3). The Torah leaves the identity of this king, or pharaoh, unstated. Many believe him to be Ramses II, although this has been increasingly disputed in recent years. Jochebed, the wife of Amram, bore a son and kept him concealed for three months. When she could keep him hidden no longer, rather than deliver him to be killed, she set him adrift on the Nile in a small craft made of bulrushes coated in pitch. The daughter of the pharaoh discovered the baby and adopted him as her son, naming him "Moses." Moses' sister Miriam observed the progress of the boat and asked the princess if she would like a Hebrew woman to nurse the baby. Jochebed was employed as the child's wet nurse. After being weaned he was brought again to Pharaoh's daughter and was raised as her son, a prince of Egypt. Scholars who regard the story as a legend note that it Moses bears a striking resemblance to that of King Sargon I, founder of the Semitic dynasty of Akkad, c. 2360 B.C.E., who likewise was placed in a basket of reeds and pitch by his mother and floated down a river (the Euphrates) where he was drawn out and eventually rose to become a prince. However, his name (ignoring the Bible's false etymology from the Hebrew verb "to draw out") is most certainly a royal Egyptian name: the element -mose is found in such royal names as Tut•mosis, Ra•meses and Ah•mose means "born of (divinity)," as adding the name of a deity gives "born of Toth," "Born of Ra" and "Born of Anu" respectively. The name "Moses" is thus indicative of his royal status. Some scholars have theorized that Moses' reforming zeal arose not from any awareness imparted by his mother, but because he was a member of the Egyptian nobility that championed the monotheistic religious reforms of Akhenaten. This was the hypothesis put forth by Sigmund Freud in his 1937 book Moses and Monotheism. Egyptologist Ahmed Osman even proposed that Moses and Akhenaten were the same person (Moses and Akhenaten, 2002). Opponents of these views point to the fact that the religion of the Torah is very different from Atenism in every respect except the central feature of devotion to a single god. While Freud's and Osman's primary theses may thus be dismissed, the idea that Israelite monotheism has something in common with Akhenaten cannot be completely disregarded. If Moses was motivated primarily from religious conviction, then his exile in Midian may have resulted from events within the palace, after the failure of efforts to transform the religion of all Egypt. When Moses grew to manhood, he left the palace and witnessed an Egyptian mistreating a Hebrew slave. He grew enraged and killed the Egyptian, hiding his body in the sand. The next day, seeing two Hebrews quarreling, he endeavored to separate them, whereupon the aggressor complained: "Who put you in charge of us and made you our judge? Are you planning to kill me, just as you killed that Egyptian?" (Exod. 2:14). The pharaoh now sought Moses' life, and he fled across the Sinai Peninsula to Midian. This incident raises a classical ethical problem of when—if ever—it is permissible to kill a human being. It also leads to speculation as to just why killing an ordinary Egyptian was so dangerous—for a man who had all the prerogatives of a prince. Perhaps the danger came because it exposed what had been Moses' private realization—that he was not really of the royal family but a Hebrew, and that his sympathies lay with his enslaved compatriots. The murder, if found out, would raise suspicions of disloyalty. Therefore, the key actors in the story were the Hebrew slaves who had witnessed the deed. Had they sensed Moses' sincerity they would have been discreet about what they had seen, but since they only could see Moses as an Egyptian prince and not as one of them, they spread the word and thus exposed him. Herein lay Moses' later reticence about returning to his people without a spokesperson to go before him whom the people would trust. The theme of the people's distrust of Moses continues throughout the narrative, returning at the incident of the Golden Calf and the various "murmurings" in the wilderness. In Midian he settled with Hobab, or Jethro, a priest of Midian, whose daughter Zipporah he eventually married. There he lived as a shepherd, during which time his son Gershom was born. According to a late tradition recorded in Acts 7:23 and 7:30, Moses was forty years old at the time he began his exile, and he endured forty more years of exile in Midian before he returned to Egypt. There is nothing in the narrative of the Hebrew Bible to indicate this chronology; rather, it relates that Moses left for Midian as an unmarried man, married shortly after arriving in Jethro's camp, and returned to Egypt with his wife and their son who was but a child. Moses was still not satisfied, however, remembering the cold reception he had received from the Hebrews when he killed the Egyptian. He asked that a spokesperson be given him, someone of eloquent speech whom the people would trust (Moses could speak well enough, but his first language was Egyptian, not the Hebrew dialect of his people). God sent him his "brother" Aaron, a well-respected leader of the Hebrew community, to go before Moses as his spokesperson and thus guarantee that the Hebrews would listen to him and respect his leadership. Moses returned to Egypt, where he was met on his arrival by his elder brother, Aaron, and gained a hearing with his oppressed brethren. It was a more difficult matter, however, to persuade the pharaoh to let the Hebrews depart, supposedly only for a short journey in order to offer sacrifices to their deity. God gave Moses the power to perform powerful signs to demonstrate his authority, such as turning a staff into a snake and turning the Nile into blood, yet the pharaoh’s heart was hardened (Exod. 7). God then sent ten plagues upon the Egyptians, each one predicted by Moses. Still the pharaoh refused the Lord's command through Moses: "Let my people go." Instead, he punished the Israelites by making their work even harder. The plagues finally culminated in the slaying of the Egyptians' first-born sons. The Hebrews were protected from this calamity by painting a lamb's blood on their door-posts, a sign for the Angel of Death to pass over their homes. This story is commemorated in the feast of Passover, celebrated by Jews throughout their history. Only after the king's own son died in this plague did he finally give permission for the Hebrews to leave. Scholars have sought to explain these plagues as natural events. For example, several of the plagues resemble actual pestilences common in the ancient world. Some theorize that a massive volcanic eruption on the Greek island of Santorini in the 1600s B.C.E. was responsible for many of the plagues. In recent times, volcanic clouds are known to have caused phenomena similar to several of the plagues, such as prolonged darkness, hail, discoloration of rivers, cattle diseases, migration of frogs, human skin diseases, etc. Thus, many of the miracles described in the story of Moses could have been natural occurrences. However, to accept the biblical account of their initiation by God directly at the hand of Moses is not a matter of nature, but of faith. The Hebrews gathered up all their belongings, taking their flocks and herds, and moved east towards the Red Sea. They were guided by a miraculous pillar of cloud by day and pillar of fire by night. Eventually, they found themselves facing the sea. Traditionally, the site of the crossing of the Red Sea is the northern arm known today as the Gulf of Suez. However the Hebrew term Yam Suph actually means "Reed Sea" and many scholars believe these events took place farther to the north, where several shallower bodies of water present plausible crossing points. Some scholars also maintain a naturalistic view of their deliverance, with a storm whipping up after the Hebrews crossed the marshy waters and causing the Egyptian chariots to get stuck in the mud and then submerged in the storm surge; this seems to be indicated by Exodus 15:10: “Thou didst blow with thy wind, the sea covered them; they sank as lead in the mighty waters.” In the traditional story, the wind whips up to divide the sea allowing the Israelites to cross, and then ceases to blow allowing the sea to return to its normal level and drown the Egyptians (Exod. 14:21, 27-28). Others theorize that a tidal wave struck the northern coastline of Egypt to account for the story of the drowning of the Egyptians. The Bible reports that 600,000 men of fighting age were involved in the exodus, making the total number of people around three million souls. Rationalists as early as H. S. Reimarus (1694-1768) subjected this history to criticism. Reimarus calculated that if this number of Israelites had moved in a column ten-across, the length of the column would have stretched for 180 miles, and would have taken at least nine days to cross. Some contemporary scholars believe that Moses, if he existed, led only a small group of escaped slaves to migrate from Egypt. Meanwhile, most of the people later known as Israelites were, for the most part, Canaanites who never migrated from Egypt at all. 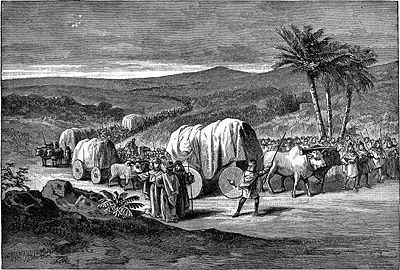 Moses' group later mingled with these "proto-Israelite" clans, which eventually federated and adopted, to one degree or another, the story of the exodus as part of Israel's national ideology. The story of Moses and the exodus became part of Israel's collective memory, even if few citizens had ancestors who participated in whatever historical events it may have been based upon. An analogy might be seen in the manner in which American schoolchildren—regardless of racial or religious background—are taught to identify with the story of Thanksgiving and the Pilgrim Fathers, even though only a tiny percentage of Americans have Puritan ancestors. Another theory suggests that the exodus describes the historical expulsion of the Hyksos from Egypt. The Hyksos were a Semitic people who rose to power and ruled Lower and Middle Egypt for over one hundred years, forming the Fifteenth and Sixteenth Dynasties of Egypt (c. 1674-1548 B.C.E.). They were most likely the rulers who elevated Joseph to the position of prime minister, and who welcome the Hebrew tribes to live in Egypt with their flocks (Egyptians were farmers and did not mix well with shepherds). They were driven out by the Egyptian ruler Ahmose, who had ruled in Thebes, and the fleeing Hyksos were apparently pursued by the Egyptian army across northern Sinai and into southern Canaan. Some of the stories of the flight of the Hyksos may have worked their way into Israel's exodus saga. After escaping the Egyptians, the Bible reports that the Israelites camped at Rephidim, where they were fed miraculously with manna and quail, and with water which Moses produced from a rock (Exod. 16). Under the military leadership of Moses' disciple Joshua, they prevailed in war against the Amalekites. Finally, they camped at Sinai/Horeb. 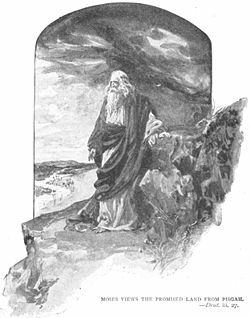 While Mount Sinai quaked and smoked, Moses climbed to the summit, where he fasted for 40 days. The location of Mount Sinai is uncertain. The traditional site in the southern Sinai Peninsula is Gebel Musa ("Mountain of Moses"), which became a Christian pilgrimage site in the fourth century C.E. when Coptic Christians founded a small church at the spot where it was believed God spoke to Moses from the burning bush. However, no Iron Age archaeological remains indicating an Israelite pilgrimage site have been found there. Furthermore, surface surveys suggest the location of Midianite settlement was in northern Saudi Arabia, east of the Gulf of Aqaba. That remote mountainous region includes several active volcanoes, several of which could be candidates for Mount Sinai. 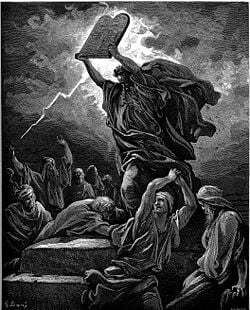 While on Mount Sinai, Moses received the Ten Commandments inscribed on two stone tablets, along with the laws of the covenant, which included both customary law and ritual ordinances (Exod. 20-24) together with God's instructions for the construction and operation of a portable religious sanctuary, the Tabernacle (Exod. 28-31). To ratify the covenant, God directed that Moses offer sacrifices and confirmed the covenant with the people of Israel in a ceremony of blood (Exod. 24:3-8) (the significance of blood for ratifying a covenant persists into the Christian Eucharist). Traditional Judaism regards all the laws of the Pentateuch as part of the original Mosaic Torah, all of it revealed to Moses on Mount Sinai. Modern critical scholars regard the laws of the Pentateuch as deriving from several collections codified in different periods of Israel's history. The Covenant Code of Exodus 21-23 may stem from the period of the Judges, instructions for the Tabernacle in Exodus 28-31 may stem from the time of King David, and the Holiness Code of Leviticus 19-26 may stem from the sixth century B.C.E. The precise content of the original Mosaic covenant probably contained more ancient versions of many of these laws, but its exact content is unknown. A verse from Jeremiah (7:22) hints that the priestly laws of burnt offerings in Leviticus were not part of the original Mosaic Law. When Moses descended, however, he found that Aaron had contrived to make a golden calf statue to which the Israelites had offered sacrifice in Moses' absence, believing that the idol represented the god(s) (Elohim) who had brought them out of Egypt (Elohim may be translated as either "God"—as "in the beginning, Elohim created the heavens and the earth" (Gen. 1:1)—or "gods"). Infuriated, Moses smashed the tablets. Rallying his fellow Levites to his side, he instructed them: "Each man strap a sword to his side. Go back and forth through the camp from one end to the other, each killing his brother and friend and neighbor." The result was a slaughter of three thousand people, for which the Levites were rewarded by being set apart as a tribe of priests (Ex. 32:26-29). The failure here was largely Aaron's, who as Moses' representative was responsible to keep them the people line; instead he was weak and bended to their will. Interestingly, Aaron was not punished. Nevertheless, his role as Moses' representative was over, although he continued to exercise the functions of the priesthood. The two men grew distant from one another, as indicated by Aaron's complaints against Moses in Numbers 12. God had raised up another man, Joshua, to be Moses' chief lieutenant and represent Moses' will to the restive Israelites. Moses then interceded with God on behalf of the remaining Israelites, for which he returned to the mountain for another 40 days. God dictated the Ten Commandments to him, and Moses chiseled them into two new tablets of stone (Exod. 34). Some scholars speculate that the story of the golden calf statue was written into the account by the priests of the Temple of Jerusalem to denigrate the tradition of calf iconography at the completing shrine at Bethel, a few miles north of Jerusalem (1 Kings 12:26-30). In this view, the calf was not an idol, but rather a throne, on which stood the invisible Yahweh. In the iconography of the Temple there is a "mercy seat" surmounted by two winged cherubim which serves as a sort of throne. However, it cannot be discounted that these polemics by rival schools drew from an original incident of disobedience. Moses to the Israelites decamp from the foot of Mount Sinai and begin their journey through the wilderness to the land of Canaan, the "Promised Land" that God told Moses would be "flowing with milk and honey" (Exod. 3:8). However, in the meantime the people endure the hardships of wilderness life. They have nothing to eat but manna, which may have been the secretion of the hammada shrub. The people begin murmuring against Moses, having become tired of their diet of quail and manna, and God strikes them with a plague (Num. 11). In Numbers 12, Aaron and Miriam complain about Moses' marrying a foreign wife and claim equal status to him as prophets. 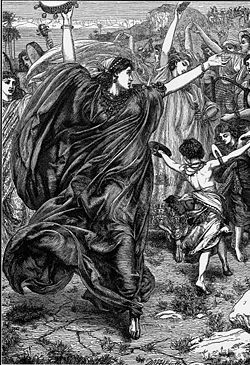 God strikes Miriam with leprosy (strangely again, Aaron is not punished—scholars think this was due to a Priestly redactor who tried to always put Aaron in a positive light). The continual murmuring and disloyalty threatens the success of the journey to Canaan and the low morale saps their confidence. Matters come to a head in Numbers 13 with the sending out of spies for 40 days to survey the land of Canaan. When they return, ten of the spies give a discouraging report; the people lose all heart and rebel. A movement arises clamoring to return to Egypt, and there is even talk of stoning Moses and Aaron (who is firmly ensconced in the role of Moses' priest) (Num. 14). God determines to kill all the Israelites with a plague and begin anew with Moses as a second Noah, but Moses dissuades God from this rash course. Instead God declares that the Israelites must now wander as nomadic shepherds for 40 years in the wilderness, one year for each day of the futile spying mission. The entire generation over 20 years of age will perish in the wilderness, and only the new generation—plus the two faithful spies, Joshua and Caleb—will be allowed to enter. The people repent and even make an attempt to fight their way into the Promised Land according to the earlier plan, but God is now longer supporting them and they are defeated in battle. Moses then reveals several more regulations, including harsh laws such as "cutting off" anyone who sins by violating any part of the Law intentionally. 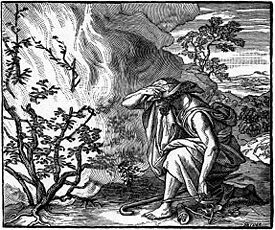 Moses proves that this rule will be enforced strictly by ordering a man to be stoned to death for carrying wood on the sabbath. At this point a Levite leader named Korah confronts Moses, saying "you have gone too far." Korah is supported by 250 other leaders who argue for a more democratic rule, saying, "The whole community is holy, every one of them, and the Lord is with them. Why then do you set yourselves above the Lord's assembly?" Moses and Aaron face the rebellious group in a showdown at the Tent of Meeting the next morning. God shows which side is truly holy by causing the earth to open and swallow Korah and his followers with their children (Num. 16). When the people blame Moses and Aaron for this slaughter, God sends another plague upon them. With the rebels out of the picture, God appoints Aaron hereditary chief priest with those Levites who remained loyal as his assistants. Additional sacred rules are also revealed. The story of Moses here takes a notable downturn. The Israelites are blocked from passing through Edom's territory, resulting in Israel's "turning away" from them—a metaphor for the ensuing long-term enmity between the Israelites and the Edomites, traditionally considered to be the descendants of Israel's brother Esau. Aaron soon dies, leaving Moses without siblings; and we hear nothing more about his wife and son. Forced to fight their way in a backtracking movement toward the Red Sea, the Israelites again fall into their complaining mode. In retribution, God sends poisonous snakes against them and many are bitten. When they repent, Moses fashions a bronze serpent (Num. 21:9:9), and those who gaze upon it are healed. The bronze serpent reportedly found its way to Jerusalem and remained a sacred object to the Israelites until it was destroyed by King Hezekiah (1 Kings 22), who considered its veneration idolatrous. Following several more trials and battles, the Israelites finally make themselves ready to enter and conquer Canaan. Moses commissions Joshua as his successor, instructing him to "be strong and bold" in leadership. Approaching Canaan from the east though today's territory of Jordan, God promises "your territory will extend from the desert to Lebanon, and from the Euphrates River to the western sea" (Deut. 11:24). In towns belonging to Hittites, Amorites, Canaanites, Perizzites, Hivites and Jebusites, all inhabitants are to be slain, including women and children. Other towns are to be offered peace if they agree to become slaves to the Israelites. If not, the men are to be slaughtered, while the women and children become "plunder" (Deut. 20:10-17). However, Moses will never see that day. A wealth of stories and additional information about Moses can be found in the Jewish genre of rabbinical exegesis known as Midrash, as well as in the primary works of the Jewish oral law: the Mishnah and the Talmud. They speak of Moses' sterling character and his model of dedication to his people. New Testament writers often compare Jesus' words and deeds with Moses' in order to explain Jesus' mission. Many scholars consider the Gospel of Matthew to consciously present Jesus as a new Moses. In the Book of Acts, on the other hand, the rejection of Moses by the Jews when they worshiped the Golden Calf is likened to the rejection of Jesus (Acts 7), and various passages in the gospels show Jesus to be, if not directly abrogating the Law of Moses, at least teaching that a person's internal attitude toward God is more important than external obedience to the letter of the Law. The writings of Saint Paul take this attitude to greater lengths, stating that just as Moses had to wear a veil because the Israelites could not bear to gaze directly at the divine splendor, so Jews who rely on the Law of Moses have veiled minds and cannot clearly see the surpassing splendor of Christ (2 Cor. 3:7-16). When Jesus meets the Pharisee Nicodemus in the third chapter of John, he compares Moses' lifting up of the bronze serpent in the wilderness to his own being lifted up (by his death and resurrection) as a healing act. In the sixth chapter John, Jesus responds to the people's claim that Moses provided them manna in the wilderness by calling himself the "bread of life." 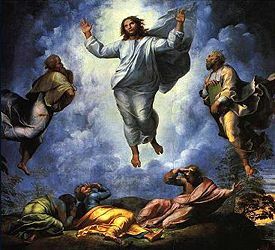 Moses is presented in all three Synoptic Gospel accounts of the Transfiguration (Matthew 17, Mark 9, and Luke 9) as appearing in glory along with the prophet Elijah to discuss God's plans with Jesus. When Muhammad ascended to heaven (the Miraj), he met Moses as well as the other prophets, with whom he consulted about how many prayers his followers should recite each day. According to the hadith, God originally prescribed fifty prayers per day, but Moses convinced Muhammad to bargain with God to bring the number down to five. This is a new twist on the biblical tradition of Moses as the intercessor who begs for God to be merciful to the Israelites. The biblical Moses' weakness of anger lies at the root of the delightful legend in the Qur'an of Moses and al-Khidr, the "green one" (Q 18:65-82). Moses goes to him to receive instruction on patience. He then proceeds to take Moses on a journey where three times he does irrational things: He drilled a hole in a ship to scuttle it and drown its crew; he killed a young man seemingly for no reason, and he fixed a broken wall in a town where they were treated rudely. The exasperated Moses cannot hold back his questions and fails the test of patience. Then al-Khidr explains the benevolence of his deeds, which relate to a reality hidden behind appearances, a level more profound than the outer world of the law that Moses knew so well. If the Bible gives an accurate description, then by modern standards both Moses and God called for acts amounting to murder and war crimes. For instance, according to Numbers 31:11-18, God commanded that every Midianite man should be killed, and Moses even ordered the massacre of women and boys, together with the enslavement of virgin girls. Other examples include God's killing Korah and his followers for challenging Moses, Moses ordering the death of a man carrying wood on the sabbath, God's slaying of the first-born sons of the Egyptians, and God's policy of genocide against the Canaanite tribes as expressed in Deuteronomy 20.
) The traditional approach assumes that since God is good and the Bible is God's Word, whatever the Bible reports God as doing must be good. Biblical characters, the situations described, and the words said took place as the Bible says. Moses, in the traditional Christian view, was a good man, and his ethics reflected both his trust in God and what was appropriate to the harsh standards of the time. With the passing of time and the coming of the Christian dispensation (as well as the more sensitive ethics of Rabbinic Judaism), God chooses to deal with humanity according to more merciful standards. Therefore God would most likely not ask a modern Christian or Jew to act in the ruthless manner that he required of Moses. Yet like Moses of old, people today are still responsible to do what God requires of them.
) Liberal Christians and many Reformed Jews reject this approach. They hold that the texts of the Bible are the work of human authors. In this view, the situations described in the Bible do not necessarily represent divinely inspired truth but instead represent the views of the biblical writers and editors, who may or may not have had theological or political agendas inspired by God. These human agendas can mislead people, who take them as if they were divine truth. Thus, it is the conscience, and not the literal words of the Bible, that is God's ultimate ethical guide for humankind. Near the end of the book of Exodus (34:29-35), Moses is forced to veil himself because the people are frightened by his appearance after meeting so intimately with God. There is one longstanding tradition that either rays of light or horns emanated from Moses' head grew. This is probably derived from a mistranslation of the Hebrew phrase "karnu panav" קרנו פניו. The root קרן may be read as either "horn" or "ray." "Panav" פניו translates as "his face." If interpreted correctly those two words form an expression which means that he was enlightened, and many rabbinical commentaries explained that the knowledge that was revealed to him made his face shine with enlightenment, and not that it suddenly sported a pair of horns. The Greek translation of the Bible, the Septuagint, properly translates the Hebrew word קרן as δεδοξασται, “was glorified,” but in the Latin version, Jerome translated it as cornuta, horned. This tradition survived from the first centuries C.E. well into the Renaissance. Many artists, including Michelangelo in a famed sculpture, depicted Moses with horns. ↑ BBC - Religion & Ethics - Moses Retrieved August 9, 2007. ↑ On the dependence of the traditional splitting of the sea on Canaanite myth, see Frank Moore Cross, Canaanite Myth and Hebrew Epic (Cambridge, MA: Harvard University Press, 1973). ↑ James C. Livingston, Modern Christian Thought (New York: Macmillan, 1971), p. 30. This page was last modified on 29 August 2008, at 14:51.